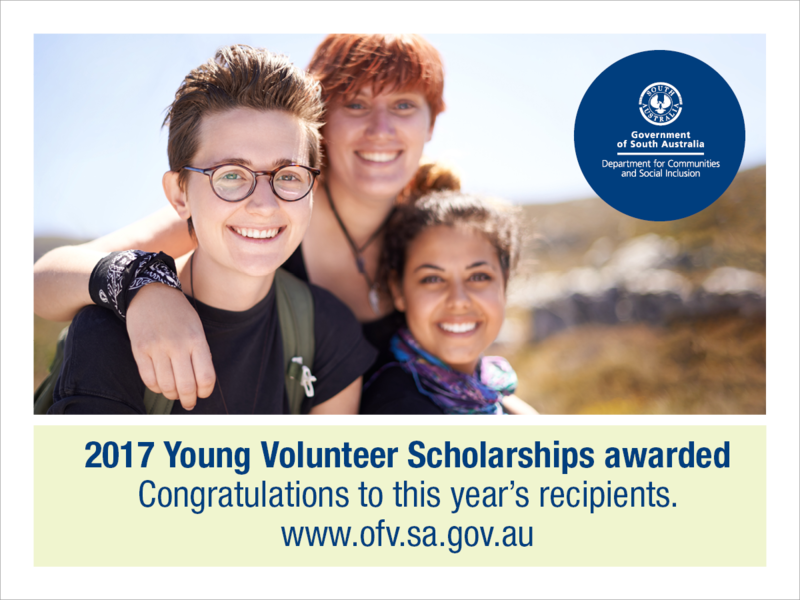 The 2017 Young Volunteer Scholarships have been awarded to 39 young South Australians who volunteer in the community. The scheme, run by the Department for Communities and Social Inclusion, provides up to $3000 each to eligible people aged under 25 who volunteer their time to help others. The scholarships reward young people who continue to volunteer while studying by contributing towards the cost of course fees or textbooks for university, TAFE or a registered vocational college. Applicants are assessed on their current involvement in volunteering, history of community participation, personal motivation and the benefit of the scholarship to the individual. This year’s recipients will share in a total of $25 500. Among them are young people volunteering in the fields of health and medicine, homelessness and children’s sport. Past recipients have contributed their time, efforts and skills to organisations such as the Country Fire Service, Australian Air Force cadets and a range of sporting and community groups. Congratulations to all the recipients, and thanks to all young people who give their time as volunteers.